Drive Compact Portable Compressor nebulizer is designed to efficiently deliver physician-prescribed medication to the bronchial lung passages. It is durable, lightweight and is perfect for COPD patients. It features compact and portable design with an integrated handle for transport and powerful piston-driven workhorse compressor. Please refer to below link for Drive Aerosol Mask. 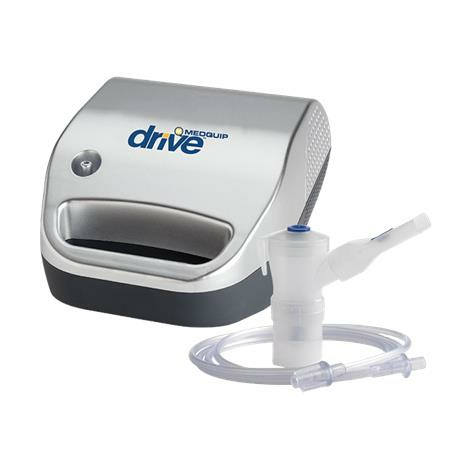 The filter for Drive Compact Portable Compressor Nebulizer is placed inside the filter holder. The filter must be replaced after approximately 30 hours of use or when it turns grey. Filter should be changed every 6 months or sooner if filter discolors. Remove filter by grasping it firmly and pulling out of the unit. Discard old filter. Replace with a new Drive filter. Additional filters should be purchased from your Drive provider. Push new filter into position. Do not reuse or wash filter or substitute any other material such as cotton for a Drive air-inlet filter. It will result in compressor damage. Show me how to connect the tubing and parts. To operate Drive Compact Portable Compressor Nebulizer, connect one end of the tubing to the compressor air-outlet connector. Assemble the nebulizer cup and add indicated medication to the nebulizer’s cup before use. Attach the other end of the tubing into the air-inlet connector found at the bottom of the nebulizer cup. Please refer user manual given on below link. Thank you for contacting customer care service.